IMPORTANT:Whether you are doing a small, large, or clustered installation, you must install the Filr appliance as described in this section. For a small installation with limited system resources, you install only the Filr appliance. The Filr appliance includes the Filr software, the MySQL database, and the search index. Install one or more Filr appliances as described in this section. Install at least one search index appliance (two search index appliances is recommended to provide fault tolerance or backup in the event that one index server fails). The process for installing a large or clustered Filr system is described in Section 2.2, Installing Separate Appliances for a Large Installation. 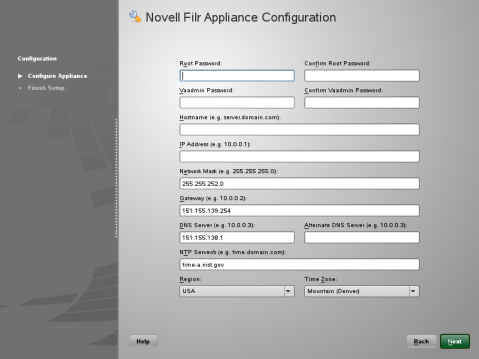 You need to download the Filr appliance and configure the virtual environment where you plan to run the appliance. This includes configuring system resources and so forth. The process of downloading the Filr appliance and configuring the virtual environment differs, depending on which virtual environment you plan to use to run the Filr appliance. Download the Filr software (Filr.x86_64-version.ovf.zip) to your management workstation. You can access the software from the Novell Customer Center (NCC). Or, you can access an evaluation version of the software from this location on the Novell Downloads page. Extract the Filr.x86_64-version.ovf.zip file on your management workstation so that the Filr-version file folder appears. In the vSphere client, click File > Deploy OVF Template. Browse to and select the .ovf file in the Filr-version file folder. In the Name field, rename the Filr appliance to a name of your choosing, then click Next. Click Next to accept the default for the disk format. Create a separate VMware hard disk (Hard Disk 2) for the appliance. This is the location where you will store your Filr files (files that are located in users’ My Files area). If you do not create a separate VMware hard disk as described here, you cannot update to a new version of Filr. In the vSphere client, right-click the virtual machine that you just created, and for which you want to create secondary storage, then click Edit Settings. The Virtual Machine Properties page is displayed. On the Hardware tab, click Add. The Add Hardware dialog box is displayed. Select Hard Disk, then click Next. Leave Create a new virtual disk selected, then click Next. In the Disk Size field, specify the amount of hard disk space that you want to allocate. The recommended minimum is 25 GB. For more detailed information about the type of information that is stored here, see Table 1-1, Filr Appliance Storage. In the Disk Provisioning section, select either Thick Provision Eager Zeroed or Support clustering features such as Fault Tolerance, depending on the VMware version that you are running. In the Location section, select Specify a datastore or datastore cluster, then click Browse. Select a datastore, then click OK. In the Virtual Device Node section, select SCSI (1:0) from the drop-down list. In the Mode section, select Independent, select Persistent, then click Next. Increase the amount of memory that VMware allocates for the Filr appliance. The default of 8 GB is the recommended minimum amount of memory for a large deployment. Novell also recommends 2 CPUs. For an all-in-one deployment, you should increase the default to at least 12 GB of memory and 4 CPUs. Small deployments require more CPUs and memory because in a small deployment, all components are running on a single virtual machine. IMPORTANT:When you increase or decrease server memory for the Filr appliance or the search index appliance, you should also modify the Java heap size, as described in Section 4.10, Changing the Java JDK Configuration Settings and Section 5.0, Configuring and Maintaining the Search Index Appliance. At least half of the memory should be dedicated to the Java heap. You cannot adjust the Java heap until after the appliance is installed. In the Virtual Machine Properties window, select Memory, then increase the setting to a suitable size for your environment. Click OK to exit the Virtual Machine Properties window. (Optional) Upgrade the virtual machine hardware version to the latest that your infrastructure can support. To do so, in the vSphere client, right-click the virtual machine that you just created, and for which you want to upgrade the hardware, then click Upgrade Virtual Hardware. Power on the appliance (virtual machine). IMPORTANT:Do not power on the appliance until you have created a separate VMware hard disk for the appliance, as described in Step 10. (Optional) Install VMware Tools on the host server. Continue with Section 2.1.2, Installing the Filr Appliance. Log in to the host server either locally or from a remote workstation. You must use the -X in the command in order to display the GUI installation program. The steps in this section use the GUI installation program to configure the server. Navigate to the /var/lib/xen/images directory on the host server. Create a new directory inside the images directory where you can download the Filr software. The name of this directory must be the same as the name that you plan to use for your Filr virtual appliance. For example, if you plan to name the Filr appliance Filr1, the name of this new directory must also be Filr1. Change to the directory that you just created. For example, /var/lib/xen/images/Filr1. Untar the Filr.x86_64-version.xen.tar.gz file in the directory where you downloaded it. A filr-version directory is created, which contains a .raw file that you will use to run the virtual image. This process can take a few minutes. The Create a Virtual Machine wizard is displayed. Select I have a disk or disk image with an installed operating system, then click Forward. Leave SUSE Linux Enterprise Server 11 selected, then click Forward. Rename the virtual machine by clicking Name of Virtual Machine, then specifying a new name in the Name field. Then click Apply. For example, Filr1. Configure the amount of memory and number of CPUs that Xen allocates for the Filr appliance. Available Memory: Displays the amount of available memory that is available on the host server. Initial Memory: 8 GB is the recommended minimum amount of memory for a large deployment. For an all-in-one deployment, you should increase the default to at least 12 GB of memory. Small deployments require more memory because in a small deployment, all components are running on a single virtual machine. Maximum Memory: Set this to the same value that you set for Initial Memory. Available Processors: Displays the number of available processors on the host server. Small deployments require more CPUs because in a small deployment, all components are running on a single virtual machine. On the Summary page, click Disks. Source: Click Browse, then browse to the .raw file that you untared in Step 6. Size (GB): The default size is 40.1 GB. This cannot be changed. Create Sparse Image File: This option is not available. Read-Only Access: Do not select this option. Create a separate Xen hard disk (Hard Disk 2) for the appliance. This is the location where you will store your Filr files (files that are located in users’ My Files area). If you do not create a separate Xen hard disk as described here, you cannot update to a new version of Filr. On the Disks page, click Harddisk. Source: This field should already contain the path to the .raw file that will be created when the virtual machine is created. If desired, you can rename the disk in the source field from disk0 to a name of your choosing. Size (GB): Specify the amount of hard disk space that you want to allocate. The recommended minimum is 25 GB. Create Sparse Image File: Select this option. Click OK to save your changes and to create and power on the virtual machine. IMPORTANT:Do not power on the appliance until you have created a separate Xen hard disk for the appliance, as described in Step 14. You can use Windows Remote Desktop to log in to the host server from a remote workstation. Create a new directory in the location where you want each virtual machine to reside (for example, C:\Users\Public\Documents\Hyper-V\Virtual Hard Disks). In a later step, you will download the Filr software to this directory. As a best practice, give this directory the same name as the name that you plan to use for your Filr virtual appliance. For example, if you plan to name the Filr appliance Filr1, the name of this new directory should also be Filr1. Download the Filr software (Filr.x86_64-version.vhd.zip) to the directory on the host server that you created in Step 2. Extract the Filr.x86_64-version.vhd.zip file to the directory on the host server that you created in Step 2. In Hyper-V Manager, right-click the disk name in the Action Pane in the left-hand column of the Hyper-V Manager window. This is the disk where you want to create the new virtual machine. Then click New > Virtual Machine. The New Virtual Machine Wizard is displayed. Review the Before You Begin page, then click Next. In the Name field, specify a name for the new virtual machine. For example, Filr1. In the Startup memory field, specify the amount of memory (in MB) to allocate to the virtual machine. 8 GB (8192 MB) is the recommended minimum for a large deployment of Filr. For an all-in-one (small) deployment, you should increase the default to at least 12 GB (12288 MB) of memory. On the Configure Networking page, select the networking card of your choice, then click Next. On the Connect Virtual Hard Disk page, select Use an existing virtual hard disk, then browse to the .vhd file that was in the downloaded .zip file that you extracted in Step 4. Click Open to select the file, then click Next. Create a separate Hyper-V hard disk (Hard Disk 2) for the appliance. This is the location where you will store your Filr files (files that are located in users’ My Files area). If you do not create a separate Hyper-V hard disk as described here, you cannot update to a new version of Filr. In Hyper-V Manager, right-click the disk that you just created, then click Settings. In the Hardware section, select IDE Controller 1, select Hard Drive, then click Add. Select Virtual hard disk, then click New. On the Choose Disk Format page, select VHD, then click Next. On the Choose Disk Type page, select Fixed size, then click Next. Name: Specify a name for the hard disk. For example, FilrDisk2. Location: Specify the location where you want the hard drive to be located. On the Configure Disk page, select Create a new blank virtual hard disk, then specify a size for the hard disk. The recommended minimum is 25 GB. Review the summary information, then click Finish. Right-click the virtual machine, then click Start. IMPORTANT:Do not start the appliance until you have created a separate Hyper-V hard disk for the appliance, as described in Step 15. Right-click the virtual machine, then click Connect. After you have downloaded the Filr appliance, configured the virtual environment, and powered on the appliance, click the Console tab. After the appliance starts, select your preferred keyboard layout in the Keyboard Language drop-down, then accept the license agreement. You can change the language the license agreement is displayed in from the License Language drop-down. The Filr Appliance Configuration page appears. Root password and confirmation: The root password for your Filr appliance. The root username is case-sensitive and should not be capitalized. Vaadmin password and confirmation: The preferred user to use when logging in to the appliance. The username is case-sensitive and should not be capitalized. Hostname: The fully qualified DNS host name associated with the appliance’s IP address. For example, myFilr.mynetwork.example.com. IP Address: The static IP address for the appliance. For example, 172.17.2.3. Network Mask: The network mask associated with the appliance’s IP address. For example, 255.255.255.0. Gateway: The IP address of the gateway on the subnet where your Filr virtual appliance is located. For example, 172.17.2.254. In a clustered environment, Filr appliances must exist in the same subnet. DNS Servers: The IP address of a primary DNS server for your network. For example, 172.17.1.1. NTP Server: The IP address or DNS name of the reliable external Network Time Protocol (NTP) server your OES server uses. For example, time.example.com. For the best results, set up NTP in accordance with the VMware best practices guidelines. Time Zone: Your local time zone. The time zone of your Filr server should match the time zone of all file servers that Filr will point to via Net Folders. NOTE:After installation, if you are not able to access the appliance and you need to change any of these settings, you can use the VACONFIG utility from the Filr command prompt. For more information, see Section D.1, Using VACONFIG to Modify Network Information. Select the data storage location. This is the location (/vastorage) where information specific to the appliance is stored and is used when the appliance is upgraded. Each appliance has its own /vastorage location. Hard Disk (recommended): This option is recommended for both small and large deployment scenarios. You must assign a hard disk to the virtual machine before you choose this option. If you have not already assigned a hard disk, click Power Off Virtual Machine, modify the virtual machine settings to add a hard disk, then power on the virtual machine. If you created a secondary VMware hard disk for this appliance as described in Step 10 in VMware Configuration, select this option. Remote NFS: Use a remote NFS location only in a large deployment scenario, where you plan to configure all Filr servers (Filr, Filr Search, and MySQL) as separate virtual machines. IMPORTANT:Before you choose this option, you must configure NFS on the remote linux server by setting the rw and no_root_squash options on the remote directory. For detailed information about how to configure NFS on the remote Linux server, see Section B.0, Setting Up Remote NFS for the Filr Data Storage Location. For more information about the type of data that is stored here, see Data Storage for the Appliance. Hard Drive: Select the hard drive you are using. If you created a secondary VMware hard disk for this appliance as described in Step 10, it is automatically detected and sdb is displayed as the hard drive. Accept the defaults for the other options on this page and skip to Step 9. Use an existing partition: Select this option to use an existing partition. Create a new partition: Select this option to create a new partition. Partition size: Specify the partition size. Filesystem type: Specify the type of file system. NFS Server Hostname: Specify the host name of the NFS server. Remote Directory: Specify the path to the remote directory. As a best practice, use vastorage as the name for the directory on the remote NFS server. For a clustered environment (where you have a separate mount point on the NFS server for each Filr appliance), you must give each vastorage directory a unique name that represents each Filr appliance. For example, vastorageA, vastorageB. Select whether you want to configure shared storage for a clustered environment. This storage (/vashare) is shared storage among all of the Filr appliances in the cluster. There is only one /vashare storage location that is used by all Filr appliances in the cluster. If your Filr system has the potential to grow, you should configure shared storage with your initial Filr installation. Doing so ensures that you can scale your system in the future if the need arises by adding additional Filr appliances. Do Not Configure Shared Storage: Select this option if you do not plan to run Filr in a clustered environment. This is suitable for a small installation where you plan to install all components as a single appliance. This is also suitable for a large installation where you plan to install only one Filr appliance. However, if you plan to grow your Filr system in the future, you should not select this option. Skip to Step 11. Remote NFS: (Recommended) Select this option if you plan to set up a clustered environment with multiple Filr appliances. IMPORTANT:Before you choose this option, you must configure NFS on the remote linux server (SLES or OES) by setting the rw and no_root_squash options on the remote directory. For more information about possible configurations when running Filr in a clustered environment, see Section 1.8, Recommended Hardware Configurations Based on System Performance. Windows servers are not supported. Remote Directory: Specify the path to the remote directory. As a best practice, use vashare as the name for this directory on the remote NFS server. A message indicating that the installation was successful is displayed. If you are performing a small installation with all components running on a single appliance, continue with the configuration of the appliance, as described in Section 3.0, Configuring Filr for the First Time. If you are performing a large installation, continue with Section 2.2, Installing Separate Appliances for a Large Installation. If you are performing a clustered installation, install another Filr appliance as described in this section (Section 2.1, Installing the Filr Appliance) until you have installed your desired number of Filr appliances. Then continue with Section 2.2, Installing Separate Appliances for a Large Installation.